The above table refers to actual sales (based on my weekly estimates) which should not be confused with BPI trade deliveries or official OCC/CIN panel sales figures. The 5.7m downloads are registered sales of legal downloads (without making the distinction between IPDs and bundles) as reported by OCC. It should be noted that 2004 was a 53-week chart year, so any direct comparison is slightly biased. 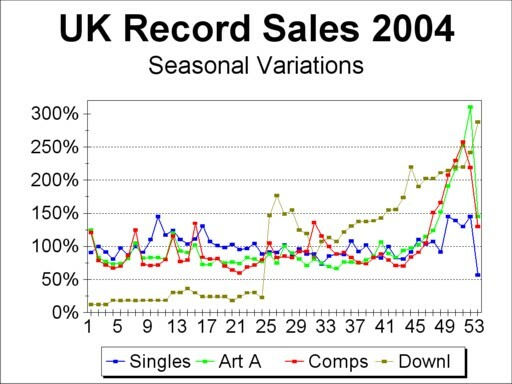 Looking at the 53-week average of 2004 against the 52-week average of 2003 we see that singles are down by 15.53% and album sales increased only by 0.56%. The average no.1 for the fourth quarter sold 101,444 copies, but if we exclude the weeks with Band Aid 20 at no.1, that average falls to 37,636. Taking into account the sales of the no.2 in those four weeks, one gets to 42,291. The annual average on that basis would drop to 55,800. That's maybe a fairer picture of 2004 than the (statistically correct) 71,400.